Why does Australia have higher solar penetration than other countries? Australia is the world’s eighth-largest producer of solar power, with an installed capacity of over 4,000 megawatts. And at the household level, Australia has the highest solar penetration rate on earth － fully 15 percent of all Australian households are equipped with solar panels (and some estimates place the number as high as 20 percent). In the U.S., by contrast, less than one percent of all households have solar panels. And in Belgium, which boasts the world’s second-highest rate of household solar penetration, just 7.45 percent of all homes have solar panels. This section closes the presentation of government-sponsored enterprise with a quick look at other GSEs. They work in a similar fashion to the FCS, by issuing securities and using the proceeds to buy or to back illiquid financial instruments held by financial institutions. The goal is once again to lower the level and volatility of interest rates on specific financial instruments and to encourage credit for specific economic activities. In their second estimate of the US GDP for the third quarter of 2017, the Bureau of Economic Analysis (BEA) reported that the US economy was growing at a +3.30% annual rate, up +0.32% from the previous estimate and up +0.24% from the prior quarter. Is the Keynes Investment Multiplier Actually a Divider? British economist John Maynard Keynes transferred Richard Kahn’s employment multiplier into the concept of an investment multiplier. Others used the same formula to arrive at a Gross Domestic Product (GDP) multiplier. Portrayed by Keynesian followers as an advantage for government deficit spending and featured as a significant advance in economic thought for determining public policy, the ‘multiplier” could be misunderstood and not deliver the benefits it promises. Portfolio management companies provide a wide variety of placement opportunities to economic units with spare funds who do not want to, or cannot, directly buy securities or other assets. There are three broad types of portfolio management companies: mutual funds, closed-end funds, and unit investment trusts (UITs). One of the main differences between them is the characteristics of the shares they issue in terms of marketability and redeemability. The Trump administration and its lower tax advocates have not provided adequate analyses and proofs to validate their opinions. Proponents of lower corporate taxes, who claim it will make corporations more productive and escalate production activity, may find their proposals do not automatically make corporations more competitive and benefit the economy less than equivalent government spending. Lowering income tax rates benefits the economy. Raising income tax rates harms the economy. Surely, there is a reason why in writing the General Theory Keynes was in search of “a theory of output as a whole.”1 Without it, one cannot understand money, banking, and the economic process. Please share this article – Go to very top of page, right hand side for social media buttons. Due to the size of this post, it has been split into 2. You can find part A here. Click for larger image of U.S. Treasury note. Due to the size of this post, it was split in two. You can find Part B here. The M&B series is back! The goal is to finish the first complete draft of the book by the time I need to teach my Money and Banking course. Over the coming months, the following topics will be covered. We all know just how valuable French vineyards are. Just think: the owners of the Bordeaux vineyards are getting Chinese customers to pay more than $5,000 per bottle! The US Has Been Running a Huge Trade Deficit for Years: How Can This Happen Without the Dollar Weakening? Many bemoan the large US trade deficit which represents the difference between the export and import of certain goods and services. Since 2000, the US has run an annual deficit ranging between $362 Billion (2001) and $762 billion (2006). Imports require Americans to spend dollars thereby increasing global dollar supplies while US exports reduce dollar supplies. That means imports should weaken the dollar while exports should strengthen it. It follows that such large deficits (net imports) should also weaken the dollar. We are early into the Trump Presidency, but it is not too early to ask how he will pay for the initiatives he is promoting. Of course, much of this has to be speculative inasmuch as we have no idea how Congress will “treat” his proposals. Nevertheless, the question is too important to ignore. Initially, the Congressional Budget Office projected that the President’s (or more accurately House Speaker Ryan’s) health care bill would save $337 billion over the 2017-2026 period. In an effort to win over House Republicans, Trump and Ryan made changes that reduced the savings to $150 billion. And then it failed to pass so there are no savings from health care (to date). “…the urgent needs of the Departments of Defense (DOD) and Homeland Security (DHS) in Fiscal Year (FY) 2017. An additional $24.9 billion is included to address immediate warfighting readiness needs at DOD. An additional $5. In their third and final estimate of the US GDP for the fourth quarter of 2016, the Bureau of Economic Analysis (BEA) reported that the US economy was growing at a +2.08% annual rate, up slightly from the +1.85% previously reported but down by -1.45% from the prior quarter. The improvement in the reported growth came primarily from increased consumer spending on services, with smaller increases in consumer goods spending and inventories also boosting the headline number. Offsetting those increases were continued weakening in commercial fixed investment, governmental spending and foreign trade. The BEA’s "bottom line" (their "Real Final Sales of Domestic Product", which excludes the growing inventories) grew slightly to +1.07%, although it remained down nearly 2% (-1.97%) from 3Q-2016. Real annualized household disposable income was reported to have grown by $123 quarter-to-quarter, to an annualized $39,477 (in 2009 dollars). The household savings rate weakened slightly to 5.5%. For the fourth quarter the BEA assumed an effective annualized deflator of 2.10%. Before I start this post I should make one thing abundantly clear: I strongly support the idea of a Jobs Guarantee (JG) program. I think that the benefits it might bring to society so far outweigh its potential drawbacks that implementing it should be a no-brainer not simply for anyone with progressive tendencies, but for anyone who believes that people should have the right to be independent and earn a living for themselves and their families. I have always thought of the economics of the JG program as being similar to the economics of unemployment benefits. Indeed, the JG should really just be seen as a superior version of the dole that replaces handouts with an opportunity to work, grow and develop rather than being forced to sit idle when factors outside of one’s own control force you out of the labour market. Most of the objections to the JG program (it increases worker bargaining power; it adds aggregate demand to the economy that is not backed by production; it redistributes income via price changes etc) could equally be leveled at unemployment benefits – indeed, they are by extreme right-wingers – and when I hear many of them coming out of the mouths of self-styled progressives it makes me a little queasy. Often I can only attribute these objections to fear in the face of a new idea. By contrast, Europe’s trauma of hyperinflation after World War I gave Europe’s bankers and bondholders a rationale for gaining power over governments to prevent them from monetizing their budget deficits. Prepared by the Bureau of Economic Analysis of the Department of Commerce, the Gross Domestic Product (GDP) serves primarily as an accounting function for the United States government ̶ one statement in a description of national accounts. By summarizing the monetary value and sources of services and production, the GDP reports all expenditures in the U.S.economy. Anxiously awaited, the economic statistic is employed to indicate and forecast the health of an economy. However, the GDP tends to be misinterpreted, ambiguously defined, and improperly used. Is there more to its well-arranged numbers than invigorating government officials and encouraging investors? The more accepted definition of Gross Domestic Product (GDP) has it as the “monetary value of all the finished goods and services produced within a country’s borders in a specific time period,” usually annually. The production of goods and services includes the sum of private and public consumption, government purchases, capital investments, and the trade balance, which is the difference between exports and imports. where C is consumption of goods and services, G is government spending, I is capital investment, and NX is the trade balance. Residential remodeling is arguably a better indicator of consumer sentiment than new construction, and is of similar importance as an indicator of national economic health. Remodeling of existing homes is 17.5% above its 2009 housing bust level, but remains 10.8% below its 2005 housing boom level, and that new home construction is 48.9% above its 2009 level, but remains 48.6% below its 2005 level. Year-over-year, residential new construction increased by 14.0% and residential remodeling increased by 1.9%. The following tables and graphs present seasonally-adjusted indices of an initial selection of metropolitan areas. Click for larger images below. What Is The BuildZoom & Urban Economics Lab Index And Why Is Remodeling Important? The remodeling of existing homes is an indicator of economic activity whose importance is on par with new home construction. The size of the remodeling market is about $300 billion a year, not far from the $340 billion value of residential construction put in place last year. Editor’s note: While this analysis is specific to the Berkshires, it has elements in common with many rural areas in the U.S. that are experiencing economic retrenchment and population declines. Manufacturing has left and will not return. This conclusion is buttressed by the all-pervasive political opposition to new natural gas pipelines, thereby insuring high energy prices for the foreseeable future. The well-educated young people of The Berkshires leave for the bright city lights. The Berkshires will not become the next Silicon Valley. Spending monies to attract any of these groups will for the most part be wasted. Since then, several things have changed my view. I read two excellent pieces on technology futures and interviewed six entrepreneurs who work and live in The Berkshires. I conclude there are a number of reasons to be hopeful. Concordian economics was born in 1965, when, after a summer of intense intellectual struggle with the General Theory, the writer inserted Hoarding into Keynes’ model of the economic system and found himself in a different cultural universe. The procedure is reproducible. Italians are headed to the polls this Sunday (and thus this letter is reaching you a little earlier than usual) – but no one is quite sure what is on the ballot. On the surface, the voters are considering whether to approve constitutional reforms that should make the government operate more effectively (or not, depending on your point of view). But many people think the real question is whether the current government should stay in power and whether Italy should remain yoked to the Eurozone. Coming up with an answer isn’t necessarily helpful when you can’t even agree on the question. However Italians vote, it may take some time to figure out exactly what the result means to Italy, the Eurozone, the EU, and the global economy. I am fairly confident that the ultimate outcome won’t be good, no matter what they choose. The problems are deeper than simple structural reform can cure. Before we wade into the weeds on this topic, please understand, I love Italy. I love the culture, the people, the food, the beautiful art and architecture, and the heritage the country has bestowed on all of Western civilization. I have a letter halfway done on economic/investment themes, but I’m putting it aside. For over 16 years I have written each week about what has interested me and what I have thought important. And frankly, what is really on my mind is the same thing that is likely on your mind, and that is Tuesday’s election results. So I am going to write a shorter letter on my thoughts on the election, trying to put an economic spin on the political process (since economics is the beat of this letter, not politics) and give you a heads up on what may possibly be the big story on Tuesday night. One congressional district in a state that nobody pays attention to could find itself at the center of American politics. That district’s single electoral vote could spell the difference between a razor-thin win and a tie. Seriously. And since I have a special connection with that congressional district, I will offer some thoughts on how it may go. But first, I want to share with you some of the things I’m going to be thinking about as I walk into the polling booth on Tuesday. What’s behind the property fever in China? The financial truth of the destocking of China’s property market. We use quantitative analysis to predict when the bubbles of China’s housing market will burst. 1. What’s behind the property fever in China? Before Mount Vesuvius erupted in A.D. 79, the nobles in Pompeii carried on their extravagant lives without a care in the world. Humans have very narrow visions, oftentimes can only see people around them fiddling away the good times, and have no idea that their landmarks, such as Mount Vesuvius to Pompeii, can evolve into such a deadly force of mass-destruction. Since April 2015, the property price in China has been growing fast, and the trading volume per month and price YoY growth rate have broken all previous records by significant margins. This market rally is the strongest in the 18-years long bull market of China’s housing market. Housing market speculation has become the talk of the town so much so that people would give up their own business or jobs for it. October 28, 2016 – BEA Estimates 3rd Quarter 2016 GDP Growth to be 2.91% In their first ("preliminary") estimate of the US GDP for the third quarter of 2016, the Bureau of Economic Analysis (BEA) reported that the growth rate was +2.91%, up +1.49% from the prior quarter. Most of the reported improvement in the headline number came from a +1.77% quarter-to-quarter gain in inventories, a +0.96% rise in exports, and a +0.39% uptick in governmental spending. 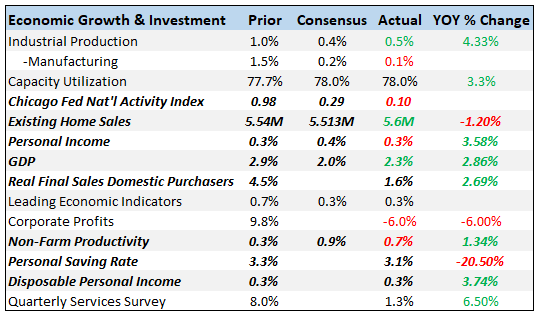 Follow up:Offsetting the improvements was an aggregate -1.41% reduction in the headline number from softening consumer spending on both goods and services. Fixed investments remained in contraction at a -0.09% annualized rate. The BEA’s treatment of inventories can introduce noise and seriously distort the headline number over short terms — which the BEA admits by also publishing a secondary headline that excludes the impact of inventories. The BEA’s "bottom line" (their "Real Final Sales of Domestic Product") was a +2.30% growth rate, down -0.28% from 2Q-2016. If we take the BEA’s "bottom line" at face value, economic growth actually softened during the third quarter. Real annualized household disposable income was reported to have grown by $127 in this report, to an annualized $39,103 (in 2009 dollars). The household savings rate remained unchanged at 5.7%. Appeared originally in Mother Pelican, May 2016. Why did we ever think that the rich few know how to administer money? This is a companion piece to the series on Monetary reform. See Part 7, which has links to all parts. The Federal Reserve System (the Fed) has pursued roughly the same type of policy for over a century now. To expect different results from the same actions, as Einstein warned, is insanity. We have to turn the Fed, our central bank, from serving the few, rather badly, to serving everyone well. If we do this, as William Jennings Bryan pointed out long ago, “all other necessary reforms will be possible, but until this is done there is no other reform that can be accomplished.” The Fed is the pivot. How can the Fed be transformed into an institution that serves all the people well? John Kenneth Galbraith was absolutely right, “The process by which banks create money is so simple that the mind is repelled.” They create money on the basis of our credit, our national credit. This (Part 7) is the final article in this series. Here we specifically emphasize two specific aspects of the second petition to reform the monetary system. Both of the petitions were described in Part 3 of this series. The second petition calls for a reduction of debt in a systematic, rational, purposeful way, rather than through a catastrophic financial collapse of the monetary system. This petition calls for the introduction of the Mosaic Jubilee Solution into the modern world. This is an extension of Part 6. Debt that enriches both creditor and debtor is a blessing. This practice has perhaps been engaged in ever since the dawn of civilization, and it is not going to be extirpated from society any time soon. Nor ought it to be so extirpated. Why? Why should it be? As soon as debt crushes the productive ability of the debtor, that debt changes its nature from a beneficent to a maleficent reality—and rational people ought to be able to identify that difference and take appropriate action to ameliorate the ensuing harmful conditions from which nobody gains and everyone suffers in one degree or another. This proposal attempts to adjust the ingenious Mosaic invention of the Jubilee Solution to the complexities of the modern world. This (Part 6) is a continuation of the previous article in this series: The Expected Effects of Petitions to Improve the Monetary System. Here we specifically emphasize the import of the second petition to reform the monetary system. Both of the petitions were described in Part 3 of this series. The attempt to cure the financial system as a whole is the import of the second petition. This petition calls for a systematic reduction of debt through a systematic reduction of zeros. Let us repeat the gist of the issue. You and Joe have one million dollars each. You are equally rich. Joe’s wealth eventually grows by leaps and bounds to $10 million. Clearly, Joe is now ten times as rich as you are. But, by hook and by crook, you raise your financial wealth to $10 million as well. You are now again as rich as Joe. What has occurred – from a purely financial point of view – between the initial and the final position? Nothing has occurred. There has been only an accumulation of zeros. Hence the second petition on the Internet: To avoid a cataclysmic reduction of financial wealth by financial crisis, the petition calls for an organized voluntary systematic reduction of zeros. This is nothing more than a suggested reproduction of the Mosaic Jubilee Solution. The two petitions (Can You Petition for Monetary Reform?) that are now circulating on the Internet are designed to do just what Bryan sought. They are designed to restore the money to the Constitution, meaning that they are designed to reconnect with the best in the American-Christian-Judeo tradition, and they are designed to transform the present monetary system in such a way as to assure us all a future that is stable, lasting, and just. The mechanics are as simple as they can possibly be. They are simple, but not simplistic at all. A few of the expected results are given below. A much longer list, affecting many more aspects of our social, political, and cultural life, could easily be provided. c. Loans to benefit all members of society.